Hector Berlioz was on his way to adding his name to “the lamentable catalogue of bad doctors” — until he was consumed by his musical obsession. Hector Berlioz — composer, critic and enfant terrible of 19th-century Paris — has successfully maintained his satanic aura since the premiere of his masterpiece, Symphonie fantastique, to shocked Parisian audiences in 1830. And no wonder: the music is laced through with opium and populated with vivid imagery of wild nights, an execution and a raucous witches’ dance. But beneath the tabloid headlines that he so loved to inspire, Berlioz’s story is more complicated. 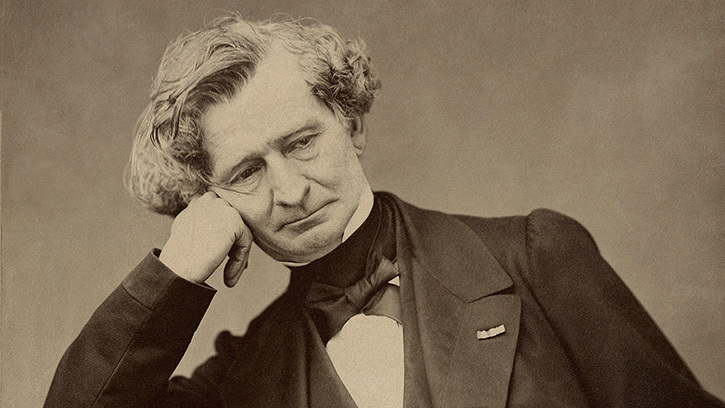 From an obscure start in a provincial village in the South of France, Berlioz struggled to balance his obsession with music with a desire to please his father by following in the family trade. He craved recognition, but constantly spurned the musical establishment. Those contradictory impulses eventually gave birth to a stunning and thoroughly original voice. This November Music Director Ludovic Morlot leads an exploration of Berlioz’s groundbreaking music with two weekends of concerts, beginning with Berlioz’s first major success, Symphonie fantastique, (November 2, 4 and 5) and concluding with his Requiem (November 9 and 11). More than 150 years after its premiere, Berlioz’s Symphonie fantastique is as shocking today as it was then. Throughout the piece, Berlioz develops what he calls the idée fixe, an almost incessant, maddening melody that haunts the music. From the dark longings in the first movement, the entire work descends into an inferno, ending with a savage witches’ dance after the protagonist of the symphony is executed for murdering his beloved. In the original German legend, Faust is a scholar who is dissatisfied with his life. He makes a pact with the devil, exchanging his soul for knowledge and worldly pleasure and a chance to experience perfect happiness. Faust’s bargain does not begin as an affair of the heart. It begins as an affair of the mind, as a pursuit of forbidden knowledge. It makes sense that this story would resonate with Berlioz. Faust’s bargain does not begin as an affair of the heart. It begins as an affair of the mind, as a pursuit of forbidden knowledge. Unlike his contemporaries — Frédéric Chopin, Franz Liszt, Niccolò Paganini and other musical prodigies — Berlioz did not come to music with an innate virtuosity. Instead, he approached his art with the feverish spirit of intellectual adventure. Growing up in La Côte Saint-André, a small village in the south of France, Berlioz read about music in encyclopedias and imagined it through vivid dreams. From his Memoirs, we know that Berlioz detested the study of medicine. After his experience at the Opera, he returned to his anatomy studies, writing “I was on my way to becoming just another student, destined to add one more obscure name to the lamentable catalogue of bad doctors.” But sometime during his days in the dissection room at the morgue, sawing skulls and singing Salieri, Berlioz struck his own Faustian bargain. He would forsake his medical studies to pursue his true passion: music. Making his way as a composer was an upward struggle for Berlioz. Yet when reading his Memoirs, it becomes clear that he relished the challenge. He enjoyed stirring scandal and provoking outrage. In his writing, he simultaneously rants about the lack of official recognition from his work while desperately craving the validation. Finally, official validation came in 1837. He received his first commission from the French government to write a Requiem commemorating the soldiers killed during the French Revolution of 1830. A massive undertaking for Berlioz, the work requires four offstage brass ensembles in addition to a large orchestra and choir. Written for more than 250 musicians, this is earth-shaking music of tremendous originality. The work was an immediate success, and one of which Berlioz was rightfully most proud, writing in his Memoirs, “If I were threatened with the destruction of the whole of my works save one, I should beg mercy for the [Requiem]." Listening to Berlioz’s music today, it can be difficult to appreciate how revolutionary it was for his time. His innovations like the idée fixe influenced composers like Franz Liszt and Richard Wagner, and his orchestral colors are still astonishingly original. But above all else, Berlioz’s music is extraordinarily expressive. It stretches tension out across long, lyrical passages in a Faustian search for resolution. Music Director Ludovic Morlot and the Seattle Symphony perform Berlioz’s Symphonie fantastique on November 2, 4 and 5 and Berlioz’s Requiem on November 9 and 11.